Weniger als eine Minute zu Fuß zur Gondel (50 Fuß, keine Höfe! )Zwei Minuten zur Skischule Lionshead - im wahrsten Sinne des Wortes! Beheizter Außenpool und 2 Whirlpools mit herrlicher Aussicht auf Vail Mountain! 2 praktische Umkleideräume mit Duschen, Handtüchern, Shampoo, etc. direkt neben Whirlpools + Sauna ... wie 3 Bäder haben! Ski & Snowboard Shop vor Ort - nur auf dem Flur! Ermäßigte Mieten mit hervorragendem Service! NEU ENTFERNTES BADEZIMMER mit Platte aus Granit, Platte, neuer Wanne und hocheffizienter Toilette, Sandstein-Waschbecken, neuer Deluxe-Wasserhahn. Waschmaschine im Gerät trägt zum Komfort bei. Kostenlose überdachte Parkplätze nur 8 Schritte von Hintertür der Wohnung. Kostenloses Highspeed-Internet ist verfügbar, sowohl für Ihren Laptop als auch im Rechenzentrum. Fabulous Southwest Restaurant, mit Blick auf die Pisten, auf dem Gelände! Luxuriöse Umkleideräume mit Duschen und Handtüchern, neben dem Poolbereich! Fragen Sie nach dem Flughafentransfer !!! Hinweis: Ähnliche 2 Schlafzimmer im Flur (# 974439) sind möglicherweise verfügbar - schreiben Sie den Besitzer für Details. Hat ein größeres zweites Schlafzimmer, mehr Sitzgelegenheiten im Wohnzimmer. Schauen Sie sich # 480958, mein renoviertes Ein Schlafzimmer mit Blick auf die Piste - für 5 Personen an. Große Exquisite Home 10 Minuten entfernt für Retreats, Wiedervereinigungen und größere Gruppen. Paketpreise verfügbar. Diese Ferienwohnung hat eine Silbernen Bewertung erhalten. Hinweis: Diese Wohnung bietet Gästen, die eine erstklassige Lage wollen, aber sind nicht besorgt über einen Blick auf die Berge. Die Wohnung blickt auf eine Stützmauer. Die Lobby mit ihren gemütlichen, gepolsterten Ledersofas und dem Kamin überblickt die Pisten und befindet sich nur eine Etage über der Wohnung. Diejenigen, die den Komfort und die Annehmlichkeiten eines First-Class-Resort mit einer freundlichen Atmosphäre wollen, wo Sie in 2 Whirlpools und Pool im Freien genießen können, während Sie einen unvergleichlichen Blick auf die Pisten, Berge und Sonnenuntergänge OHNE zahlen den vollen Preis von einem 2 Schlafzimmer . Lion Square Lodge Wohnung wird unsere Unterkünfte genießen. 1 Badezimmer mit WC in Wohnung; 2 Toiletten auf dem Flur; PLUS Umkleideräume mit Duschen, Handtücher, Seife, Lotion, Haartrockner etc. im 1. Stock neben Whirlpools und Pool ... so ist es wie mit 3-5 Bäder statt einer! Awesome location. Everything was perfect for our stay. Great place for families. Definitely recommended. Owner was helpful with coordinating at all times of the day. Meredith's condo is ideally located for easy access to everything we needed for our ski vacation. The ski rental shop is literally two doors away down an indoor hallway from the condo and the staff was extremely pleasant and helpful. There is a restaurant in the same building as the condo and the assigned parking location is inside a parking garage just a few steps from the back door, so no need to brush snow off the car when we wanted to drive. The Eagle Bahn gondola is a very short walk from the condo and valet ski storage means no hassles carrying equipment back and forth. Meredith is a friendly and gracious host and was very responsive to texts and phone calls as we scheduled our arrival and departure. Overall, it was a very enjoyable stay! Thank you, Gerry. It was great meeting you, and I'm delighted that you had such a great stay. I'm also glad that your friend thought the king bed in the master was so comfortable, and I'm finding out the info you requested so your friend can buy a similar one:) I look forward to accommodating you again when you return! Stayed New Years week 2019. Cannot be any more convenient - closest ski in-ski out location to Eagle Bahn gondola/lift in Lions Head - 10 seconds away. Ski-in to adjacent door/deck of resort where ski valet waits to take your skis - pick them up there in morning. Boom - done. For parent with kids this is ideal - no schlepping equipment around. Also a ski shop on site at the lodge. Restaurant on site, outdoor heated hot tubs (2) and outdoor heated pool on site, work-out facility with treadmills, weights, etc., free movie rentals DVD player in room. Convenience/Amenities = everything you want. Room itself was perfect for us - just as advertised. We wanted moderate room/3 star room/price - but with the convenience/lodge amenities of a 5 star ski-in ski out resort. We got it. We were family of 5, including 3 teens. Large Bdr (TV) for mom/dad; small bunkroom (no closet - no TV) for 2 teens - all they needed; comfy pull-out queen couch for 3rd teen in living room (TV/DVR). Kitchen fully stocked, coffee maker etc. Washer & Dryer! Only 1 bathroom, but there are lodge restrooms 30 secs away down hall which we used often. We also took Meredith's advice as we used hot tubs every day after skiing -and showered there in the locker room afterwards to avoid a run on the shower in our room. The room is exactly as pictured - it is on small side and has no view - brick/concrete parking garage wall outside window - so if you are accustomed to a spacious 2-3 BDR condo with slope views you might be disappointed. We have stayed in those too ourselves - in other lodges like this one - at One Ski HIll Place/Grand Lodge in Breck - and paid double for the room. This time we decided to save some $ and try to find a more affordable room yet in the same kind of resort. No regrets and definitely would do it again. We were there to ski - teens spent very little time in room - far more time on slopes and throughout the resort and in village. Perfect for us. Cannot wait to come back. Kids all say this was one of best vacations they have ever had. Meredith has other rooms in the property and was on site during our stay. She met us upon arrival and gave us a tour of the property and made us feel right at home. She had great suggestions on restaurants and transportation - great to work with! 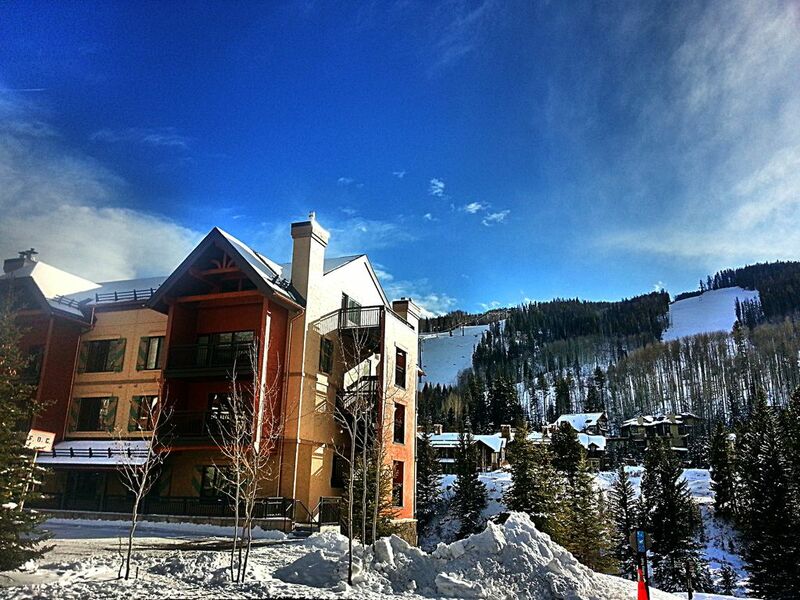 FANTASTIC ski in and ski out Condo in Vail Colorado! Our family of 4 had a wonderful getaway that felt special because of the wonderful experience we had here! The location is unbeatable - literally at the foot of the skier bridge right in front of the gondola! We got to the gondola and realized we forgot something in the condo and it took less than 2 minutes to go back and get it (round trip)! Loved the hot tubs for us and pool for the kids. The changing rooms right next to that allowed us to all shower and change right after using the amenities, so we didn't mind having only one bathroom in the condo. The aprés ski specials at the on-site restaurant were great, and we enjoyed the view of the slopes from there. Even though the condo doesn't have a view, we were able to sit in the lobby in front of the fireplace there and watch the snow falling. The ski shop is 6 steps from the condo, which made having our skis tuned SO easy! The free parking in the garage was also incredibly convenient - only steps from the back door! Loved the new bathroom that was just remodeled with beautiful granite and a cool vessel sink! Although we didn't need to use the washer/dryer for this quick trip, it will be great to have it right in the condo when we come for a longer stay...which will definitely happen in the future! Meredith showed us all around the complex and was easy to work with, which gave the experience a personal touch that is not often found. This is definitely a great value since you get 2 bedrooms for the price of a one bedroom! Can't wait to come back! This place is an outstanding value! Incredible location in Lionshead Village with all the amenities you need and then some. Last year I stayed at the Marriott which is further away, more expensive, and not as clean. Never again. On-site restaurant and wonderful staff take care of you. The ski rental shop is literally two doors down from your front door and about 20 feet away from the gondola. For us, it was a guys weekend. Four would’ve been very comfortable and we made it work easily with 5. For a family 6 is doable. Merrideth, the owner, did anything and everything to make our stay perfect as did the staff. I guess if I had to give any “negative feedback” for the sake of the review, is that there is only one bathroom. There are showers available at the sauna/hotTub (which are awesome! ), but they are down a floor and a bit of a trek in the morning. Manegable though for sure though and ultimately a convenience in a pinch! Already shared the owner’s info w some Denver family! Do yourself a favor and stay here. Location to ski rental and eagle bahn gondala ...the best! Nice outdoor heated pool and outdoor Jacuzzis. Excellent restaurant on site. El Sabor. Unit needs updating. Clean, fully equipped but updating needed. Heating system needed maintenance. Owner is on it. If you want a view, this unit does not have one. Owner was upfront about it to us. Just FYI, felt like you were in the basement. Since we were out and about the entire stay, it worked for us.